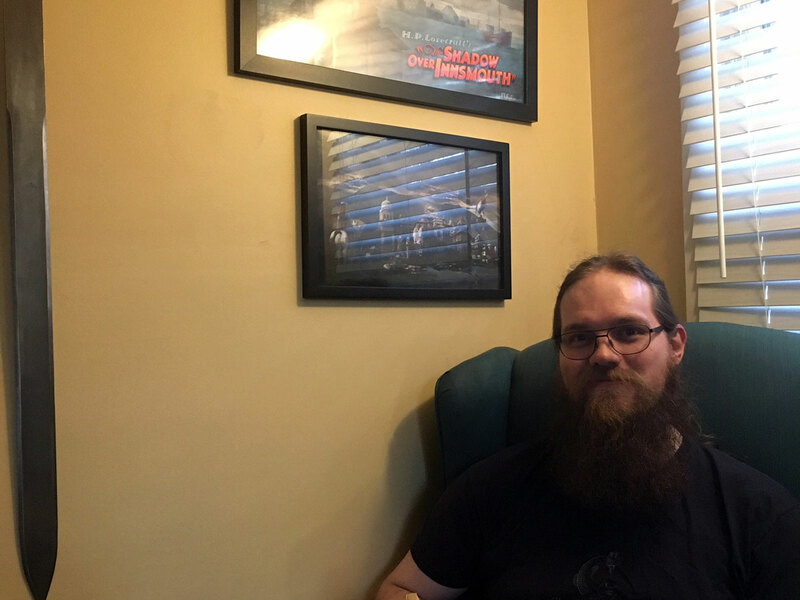 Our Member of the Month for April 2019 is Colin Christenson of Minneapolis, Minn.
Colin says: "I think my first experience with Lovecraft was when my big brother got the Call of Cthulhu roleplaying book from Chaosium. I read "The Call of Cthulhu" short story that was at the front of the RPG book and got hooked on it. After that I "borrowed" (and am still borrowing to this day) a couple books of collected stories from my brother, and then I bought all the Del Rey paperbacks I could find at the used book store. I think I found the HPLHS looking for some props and finding their free prop sets. I ended up putting Miskatonic Library stickers on everything. 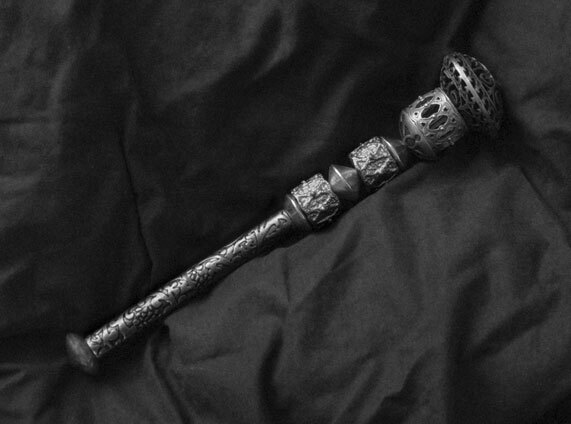 Since then I've been collecting all manner of Lovecraftian props and artifacts, but my favorite ones are usually the Historical Society ones. 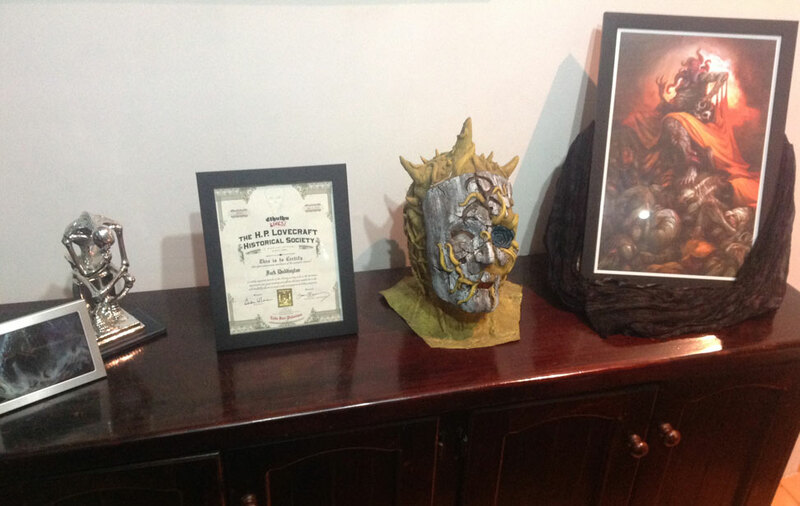 They have a very realistic feel to them and always look beautiful on a bookshelf or display. It's hard to choose a favorite story but I think I like "The Shadow over Innsmouth" the best. Just the pervasive creepiness of the town and the people gives you that sense of dread before anything even happens. It's also an awesome setting for games or other stories." 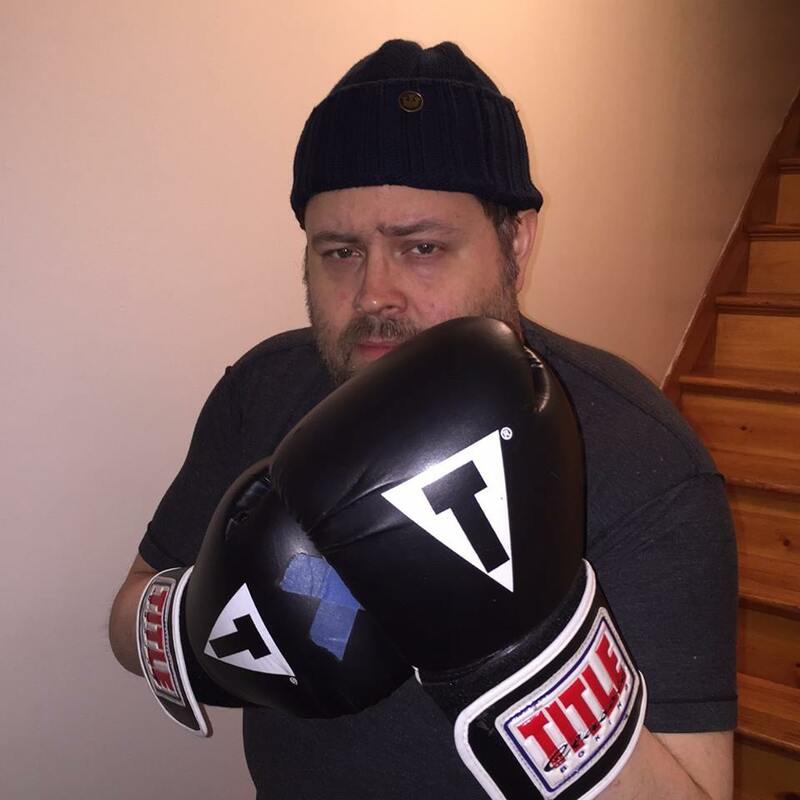 Our Member of the Month for March 2019 is Shane Truesdale of Eugene, Oregon. 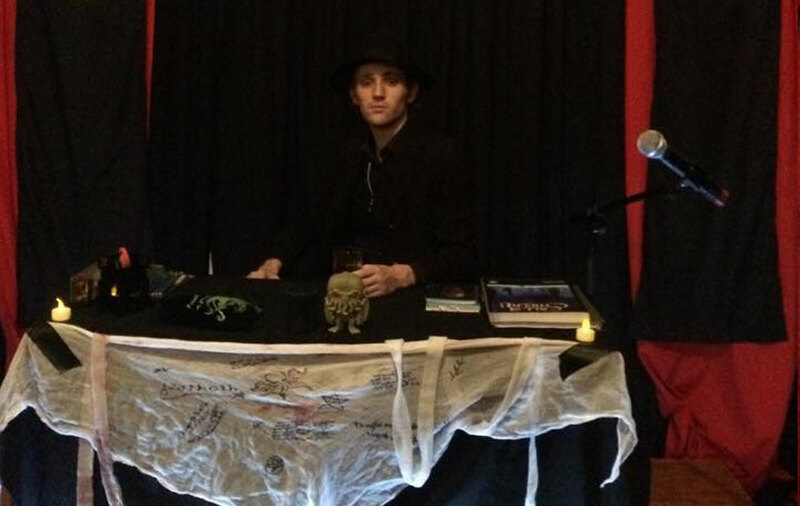 Shane says: "Hello fellow Cultist. 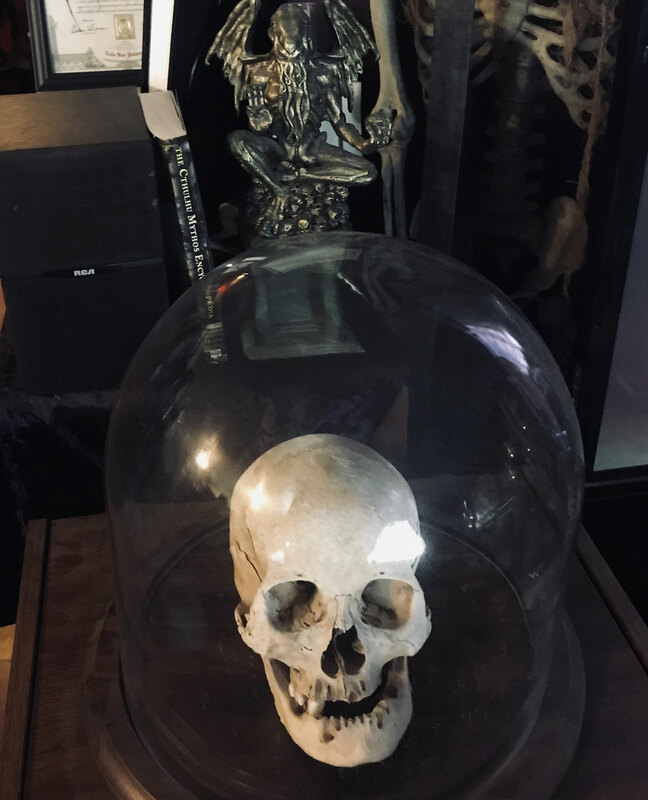 As a young boy growing up in various small towns in the Pacific North West I grew up with somewhat of a fascination with the Occult and all things related. From Books, to Movies and Music. My mind was eager to the point of being over anxious for the next thing to spark my interest in the genre. Now an Adult, I’m a collector and constantly looking for the next thing that will ignite that spark in me, while still a serious fan of the older gems in Scientific Fiction and Horror. I’m proud to be a Member of the H.P. Lovecraft Historical Society, and be given the opportunity to meet others with like interests. 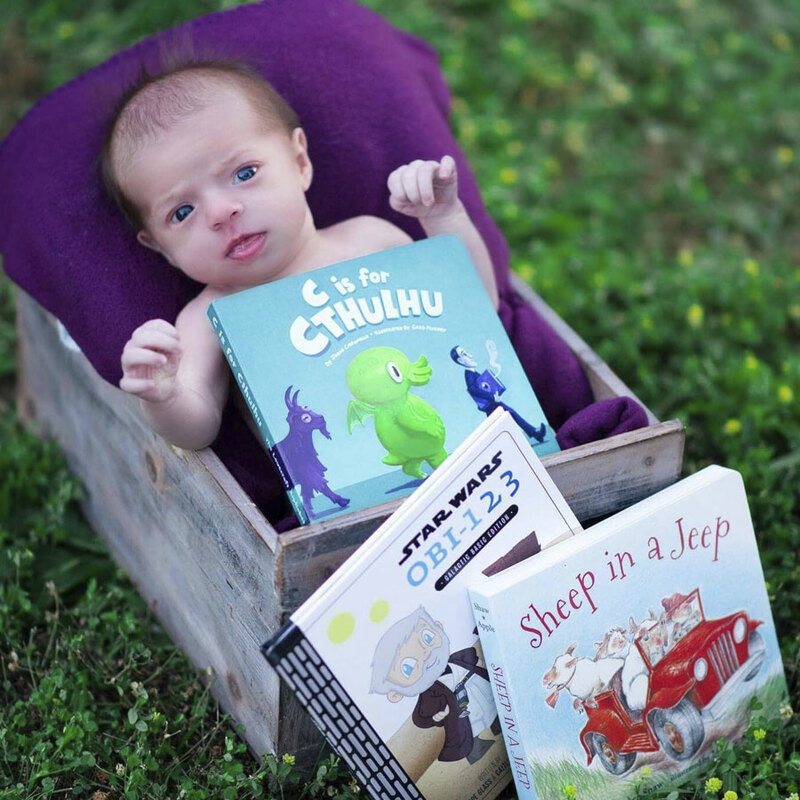 Keeping Lovecraft’s works alive and well for Future generations." 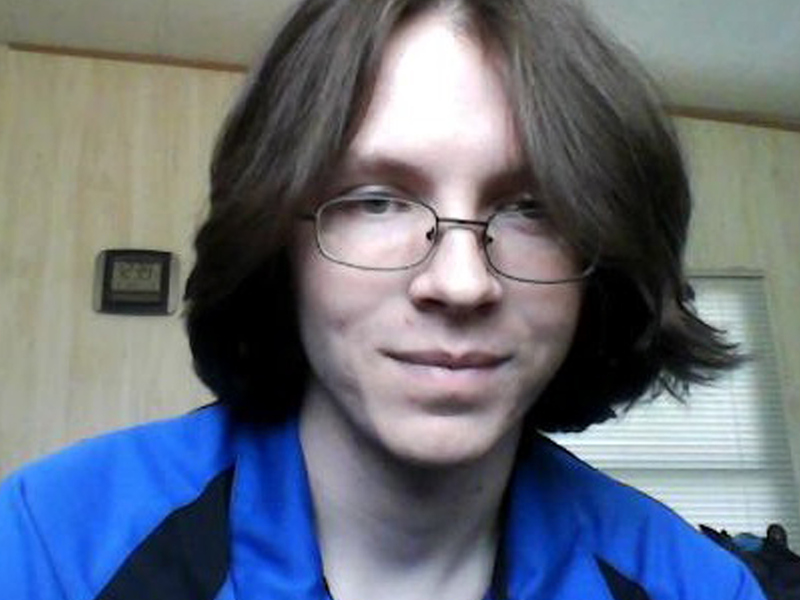 Our Member of the Month for February 2019 is Nathan Darling of Whitesboro, Texas. 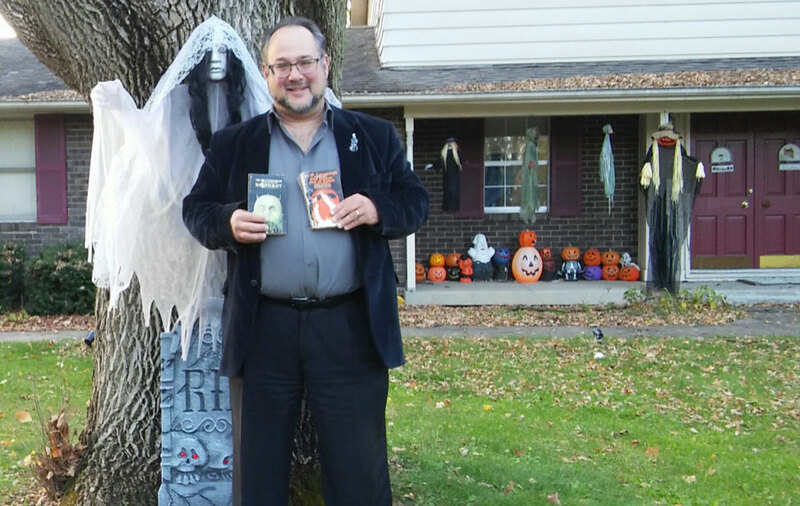 Nate says: "I have been reading Lovecraft and associated authors for years, and have always been a bibliophile. There always seem to be like minded folks around, and this group is a fantastic way to get to see how widespread HPL's influence is, I feel like less of a misfit. Thank you again for this singularly peculiar, and spectacular, award." 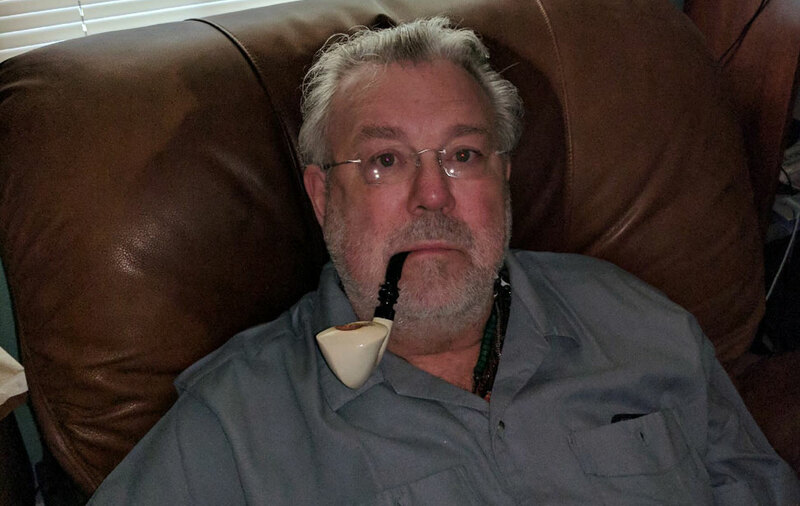 Our Member of the Month for January 2019 is Douglas Ward of Fitchburg, Mass. Douglas says: "Thank you all for choosing me for this glorious honor of the HPLHS Member of the Month. I would like to thank the academy for all their votes.... wait, wrong award! I have been a fan of Lovecraft for many years since I was intrigued by the lore from Jingo by the late, great Sir Terry Pratchett. He mentioned Cthulhu in a kind of behind the making of the story while I was at a book signing I was lucky to see him at. Since then I have seen the connections HP has had in a whole slew of modern day writers. 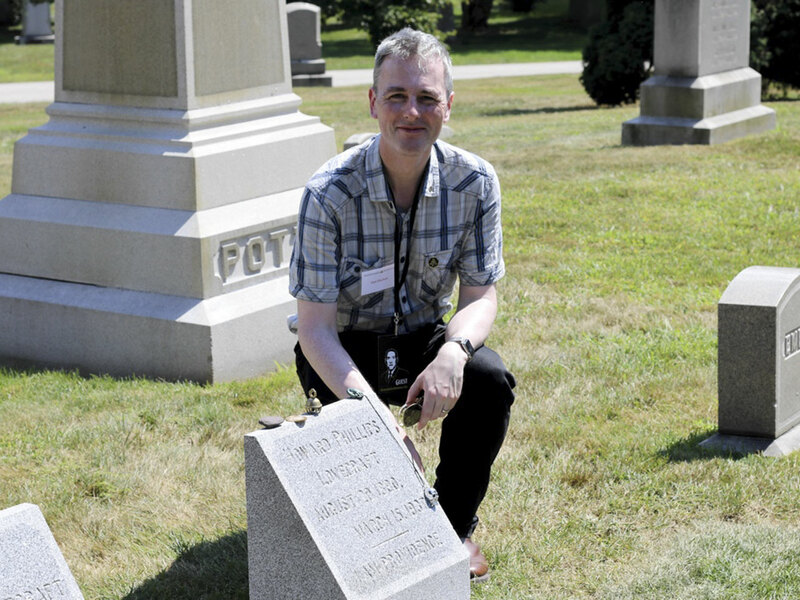 I am lucky enough to live in Massachusetts and have been down to Providence to walk the same streets that HP had and have even visited his gravesite. When I was looking up places to visit I found about the store in Providence, the Lovecraft Art and Sciences, and it had the HPLHS website linked and I clicked on it and the rest is history! I have almost the complete collection of the DART series (which I listen to almost daily as I drive) and have plastered my back window with many stickers! My job keeps me on the road and down in the Cape Cod and Providence area and reading and listening to the stories has opened up a whole new understanding of the area for me. Thank you so much for what you have done for HP's stories and bringing it to life in a whole new way. Our Member of the Month for December 2018 is Charleen Briggs of Parker, Colorado. Charleen says: "I am super excited to have been randomly chosen for the honor of December member of the month! I never win things like this! The Others have gibbered in my general direction, and I am cautiously thrilled! 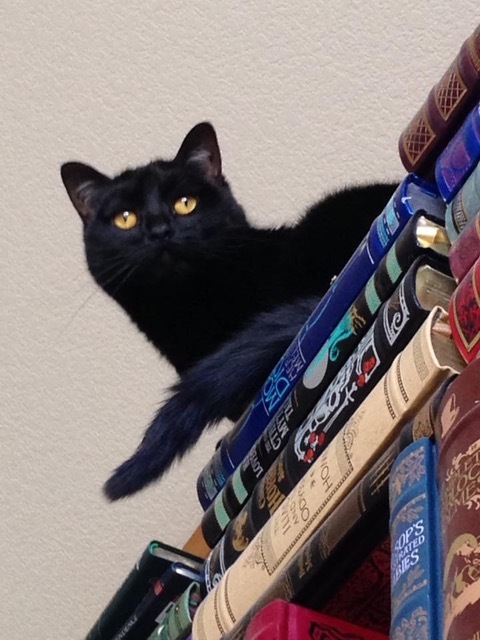 A little bit about me, besides being completely unlucky in contests and drawings: I enjoy obnoxiously singing Innsmouth sea shanties and solstice carols all year long while trying to keep my cats from summoning elder things while I’m away...above is a photo of one of the evil little demon-summoners, because they are much more photogenic than me. 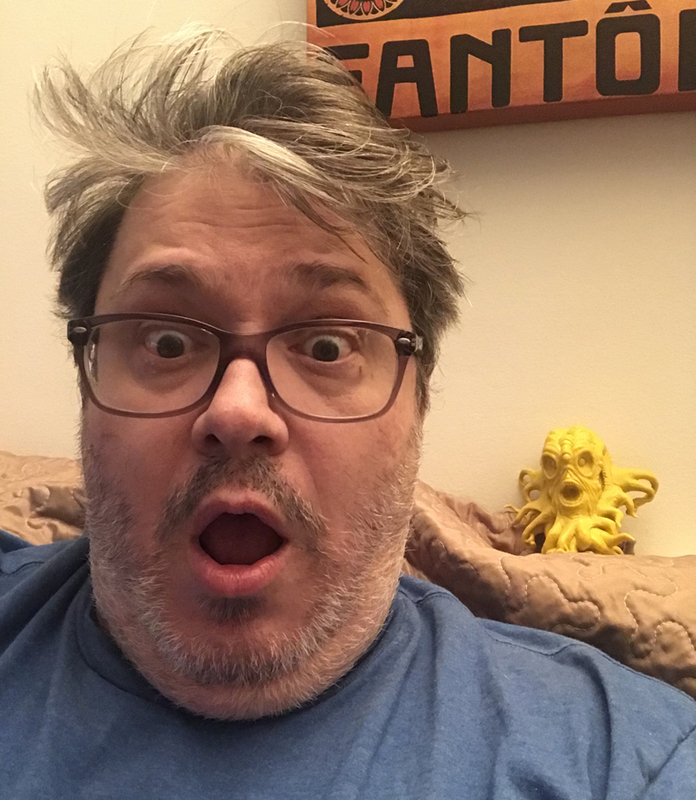 (My Innsmouth look is beginning to show...)"
Our Member of the Month for November 2018 is Stuart Welbourn of Derbyshire, England. Stuart says: "I first came across the name Lovecraft as a teenager in the 1980s when I watched Stuart Gordon's From Beyond followed closely by Re-animator (the order I watched them in, not release). As a film fan, I then always looked out for more Lovecraft releases, but only actually read a few of his tales back then. I thoroughly enjoyed what I did read & clearly they left a lasting impression. Fast forward to 2014 & as a bit of a midlife crisis, I enrolled on a Masters Degree in Film Course. I was working on my own screenplay for a dark & twisted feature film, which my mentor commented sounded a bit Lovecraftian. I then spent the next 2 years studying both Directing & Lovecraft himself. I must have read half of his fictional works during this time, but am pleased to say there are still delights for me yet to discover. 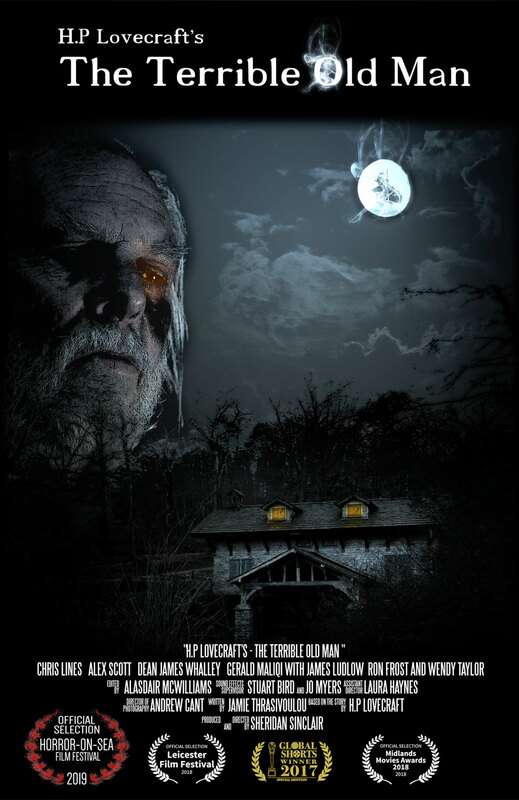 For my final film I shot a modern-day adaptation of "The Terrible Old Man" based on a screenplay penned by a local writer; which has literally just been accepted for a pretty big Horror Film Festival in the UK. Only days later, I was humbled to receive an email informing me I had the honour of being selected as Member of the Month by HPLHS. Would seem the Elder Ones bestowed upon me two great birthday gifts, as I share the same birthday as Winfield S. Lovecraft (which might explain a thing or two); but what will be the price?!" 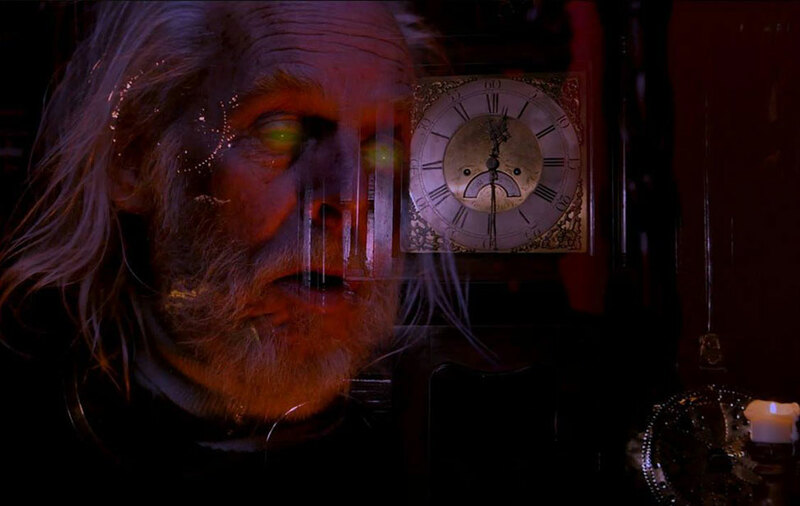 Above is a still from Stuart's film of "The Terrible Old Man", featuring Chris Lines in the title role. Congratulations to Stuart on its festiva success! Our Member of the Month for September 2018 is Eric Lawrence of Los Angeles, California. Eric says: "I was born and raised in West Lafayette, Indiana, the home of Purdue University (in retrospect, a Midwestern version of Misktatonic University, especially when one considers one of their noteworthy achievements is having graduated nearly two-dozen astronauts, who surely have seen some strange things out there in the inky darkness...) With my family I moved to Los Angeles when I was nine, and unlike HPL's experiences in NYC, I took to the big city like fungi to Mi-Go, and have lived here ever since, graduating from UCLA in '93, working as a DJ at a local public radio station for over 20+ years, and now currently working towards my M.A. in English Literature from Cal State Northridge (with a bit of a focus on the gothic, the subgenre into which HPL tends to get lumped by academics). It was while at UCLA, with their borderline eldritch library collection, that I discovered the likes of Robert W. Chambers, Arthur Machen, and, of course, HPL. 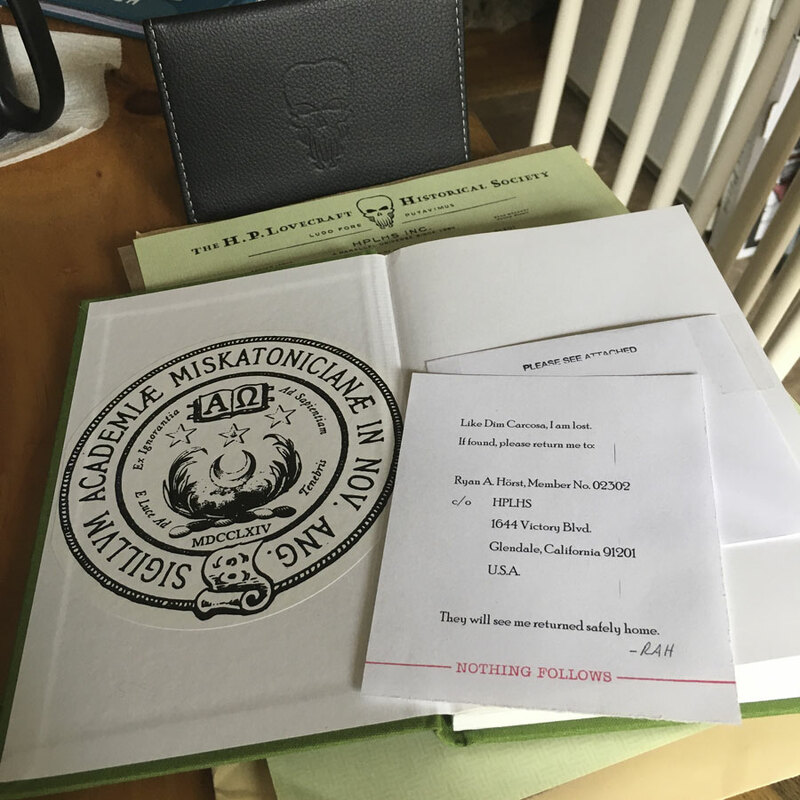 In fact, if I recall correctly, some cheeky librarian had created fake records for books like The Necronomicon, the play script of "The King in Yellow," the original 1st edition of the Principia Discordia, etc. I began visiting annual antiquarian book fairs, looking to collect assorted Arkham House books, beginning with a signed copy of one of Derleth's collections of his own short stories, but soon branching far afield & acquiring many favorites from that beloved imprint (no A Hornbook for Witches, alas). I even ventured into the Call of Cthulhu role-playing game, but rarely found investigators brave enough to venture too deeply. But the key Lovecraftian works remain a personal favorite, ones I am happy to reread and celebrate often! I am honored to be among such august company, and honored even further by this recognition! Our Member of the Month for August 2018 is Jack Duddington of Werribee, Australia. Jack says: "One fateful day when I was a child and avid reader, I was at my local library looking for a new book to read. I couldn't find a single thing I was interested in. After a while of looking, I stumbled across a book called Dagon & Other Macabre Tales by H.P Lovecraft. I grabbed the book and scampered away, looking for a private spot to read. As I sat down, the librarian asked "Do you think you should be reading that?" to which I replied "Probably not" and began reading anyway. That day I learned the horrifying wonders of Lovecraft, and I could not get enough. So, naturally, here I am today! 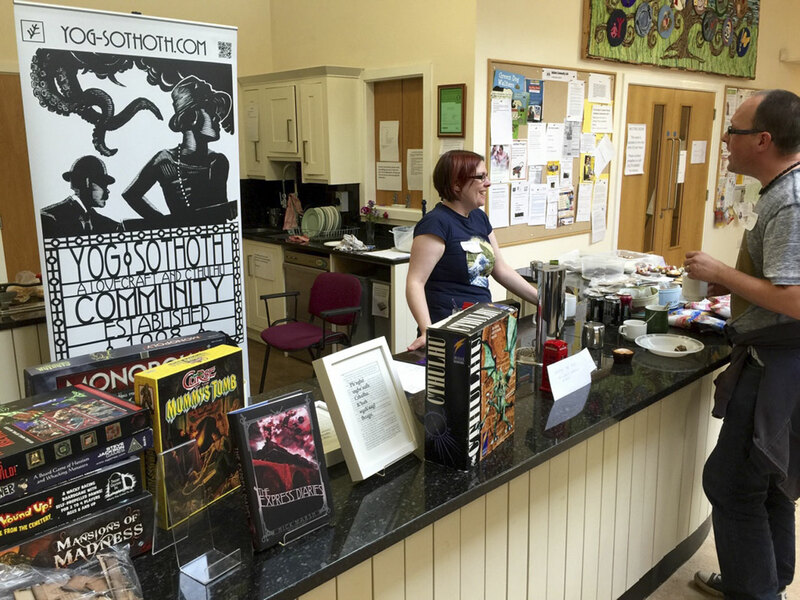 I run many varied Cthulhu events within my home town, including board game & role-playing evenings. 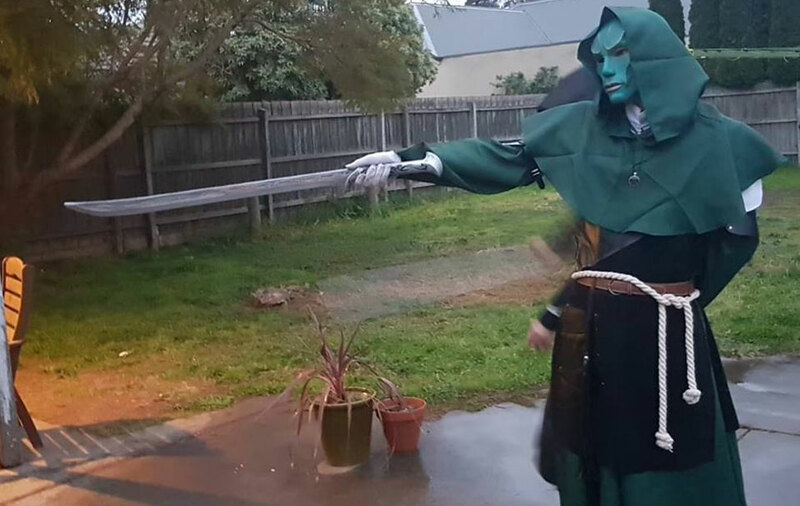 I also run a Live Action Role-playing Cult in a fantasy setting called the 'Children of the Dreamer', as my character High Cardinal Vulpa. Recently, I've tried my hand at writing some weird fiction, and am currently working on a few short stories centered around Australian history and tropes. My dream is to visit Providence, preferably when NecronomiCon is happening. 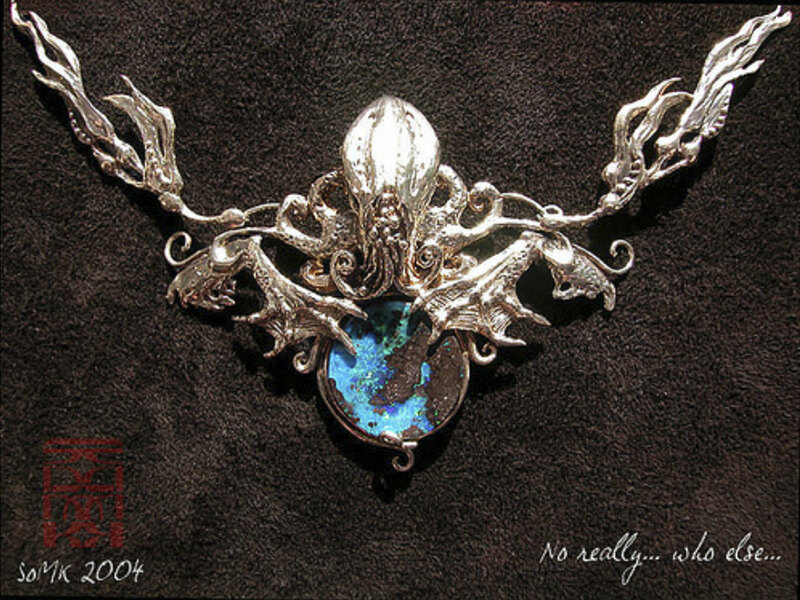 All in all, without Lovecraft's amazing fiction, I would not be the person I am today. So to him I simply say, thank you. 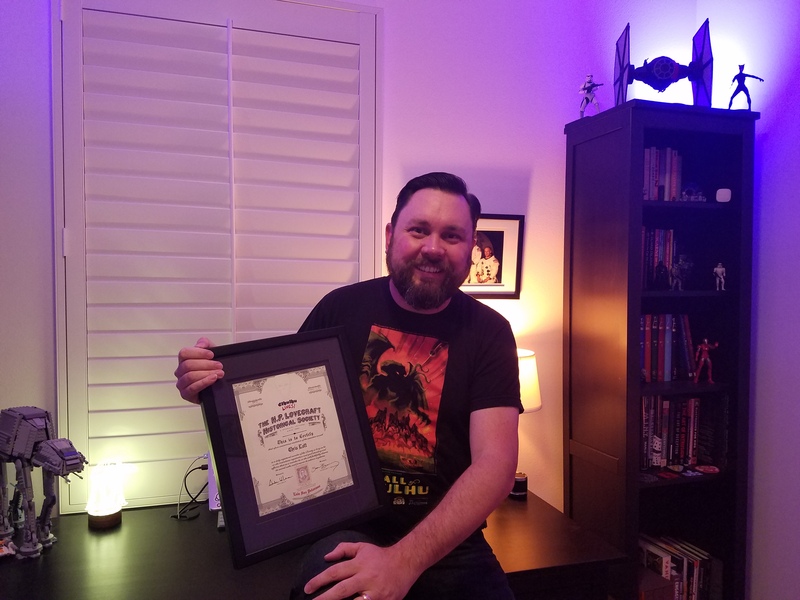 It is an honor to have my name placed here with you all, and look forward to meeting some of my fellow Lovecraft fans one day! Cheers HPLHS! Keep sharing Lovecraft with the world! 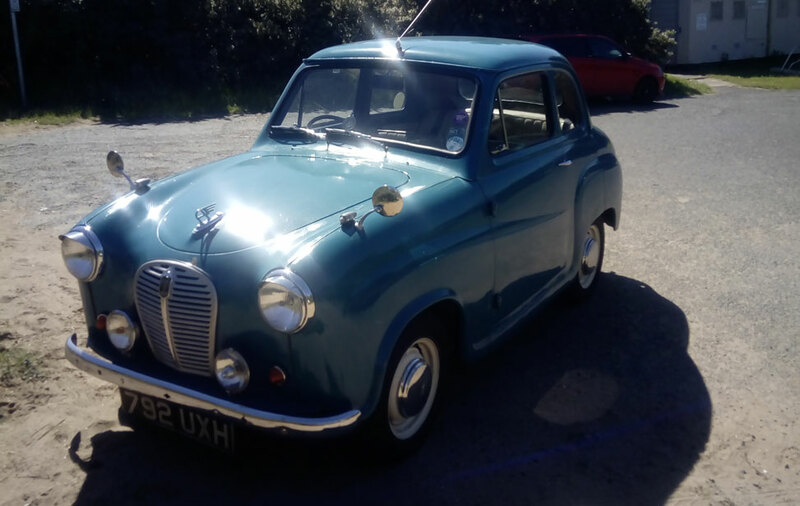 Our Member of the Month for July 2018 is Alasdair Macleod of Edinburgh, Scotland. Alasdair says: "I was aware as a young teenager that there was this weird author called Lovecraft who was responsible for the kind of chilling stories like "The Tomb", and saw illustrations suggestive of a kind of shivery ghosty horror, but it wasn’t till I got hold of a paperback copy of At The Mountains of Madness, aged about 17, that I was stunned by the depth of the concepts in his work, and was hooked. Before long I had read everything he had published, but often go back to enjoy them again. I still don’t think there’s been anything written in this field that’s better the "The Colour out of Space". 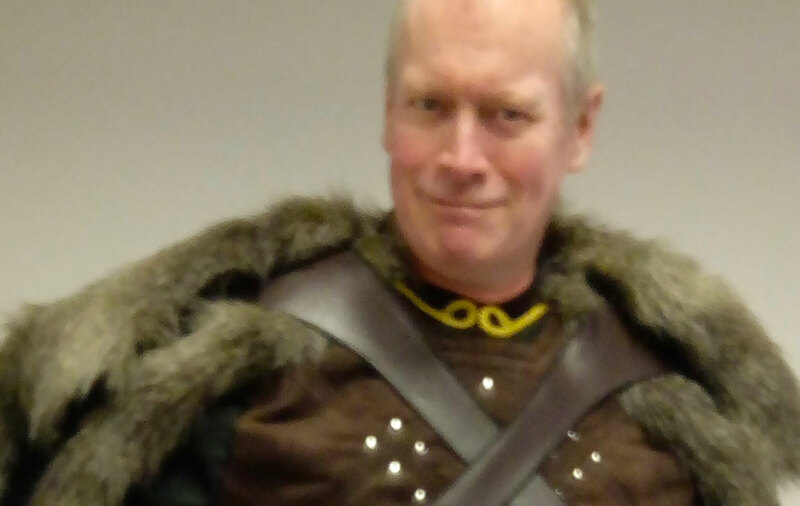 I like other sorts of Sci fi and Fantasy, so here’s me in a GOT outfit." 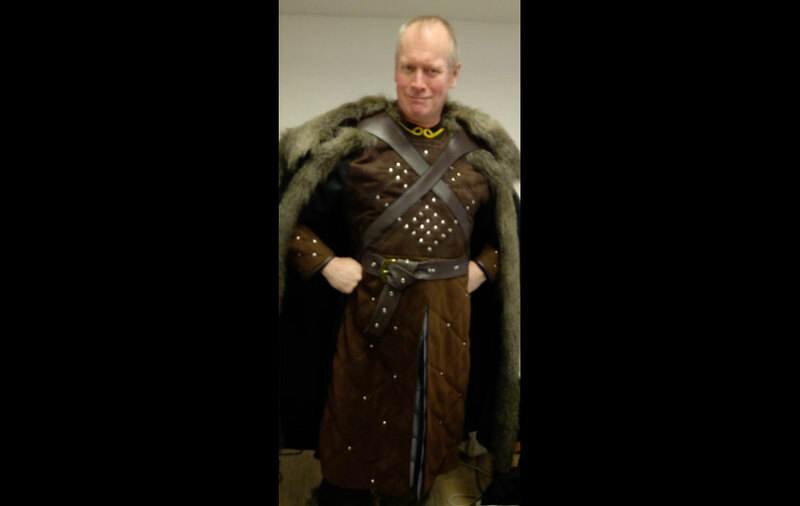 Our Member of the Month for June 2018 is Fiacre O'Duinn of Burlington, Canada. Fiacre says: "I was born in a town containing what was once the largest telescope in the world, the Leviathan of Parsonstown. I played in the the ruins of Leap Castle, the most haunted in Ireland. I walked the bogs where my ancestors sacrificed their kings to appease the gods. Distant stars, malign entities and ancient deities. When I discovered H.P. Lovecraft, I knew I was home. In high school in Dublin in the '80s I had a few friends who were horror fans. When I was fourteen one of them loaned me a forbidden tome called The H. P. Lovecraft Omnibus 1 by Panther Books where I read “The Case of Charles Dexter Ward”. I was hooked. I quickly tracked down the rest of the omnibus editions and fell in love. I disappeared down a tentacle filled rabbit hole, discovering Ramsey Campbell, the Call of Cthulhu 3rd Edition RPG, Brian Lumley, Clive Barker, William Burroughs, and so on. It peaked around ‘94 when I walked into a tiny art house cinema, The Lighthouse on Abbey Street, and saw a movie titled Cronos by some unknown Mexican guy, Guillermo del Toro. I still have that ticket stub. I always felt that “The Case of Charles Dexter Ward” had a lasting influence on my life. I moved to Canada from Ireland in the mid-nineties and, after working in the casino industry for a few years, went to university to study new religious movements (or, as they were called before we went metric, cults) and the history of western esotericism. 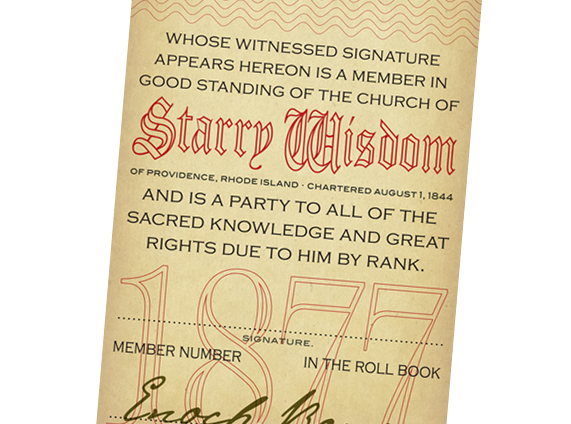 For my graduate degree I ended up doing fieldwork among former members of The Process Church, certainly one of the more Lovecraftian groups from the '70s. I completed a second masters in information science and worked in that most antediluvian and blasphemous of professions, librarianship, for a decade. My later activities included taking a class on how to start your own cult from Ivan Stang and working with Genesis P-Orridge of Thee Temple ov Psychick Youth for three years, but those are tales for another time. And I’m still trying to solve that essential saltes problem…. Last year everything seemed to come full circle as I had the opportunity to visit Providence and pay homage. Guillermo del Toro brought his exhibition “At Home with Monsters” to Toronto and on the opening day I met him, entirely by accident, as he was walking through the museum. I finally got to shake his hand and thank him for the nightmares. 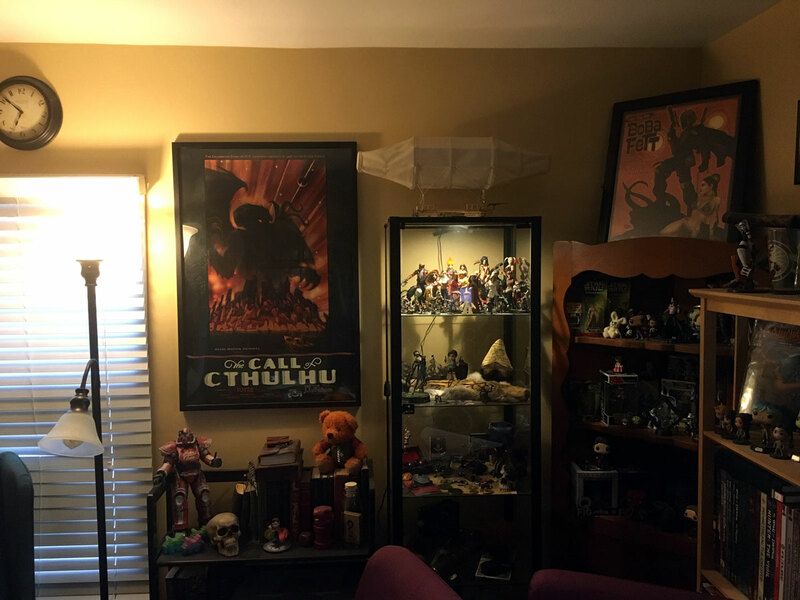 To close, after ten years of marriage my beloved wife, who has to endure my Lovecraft, horror, cult and occult obsessions, has only ever imposed one rule; “No practicing evil in the house!”"
Our Member of the Month for May 2018 is David Baxter of Guelph, Canada. David says: "I grew up in Niagara Falls, Canada, where I worked at no fewer than six crappy tourist attractions. As a teenager, a friend of mine mentioned a horror author named "Lovecraft" and my imagination was deftly captured. I picked up the one HPL book they had at my local bookstore, which was Bloodcurdling Tales of Horror and the Macabre, and thus, my first three HPL stories were "The Rats in the Walls", "The Picture in the House", and "The Silver Key". I was a little overwhelmed and took a break from the original fiction. From there, I detoured into the board games and the horror movie adaptations and had a grand ol' time. In 2010 I discovered the H.P. 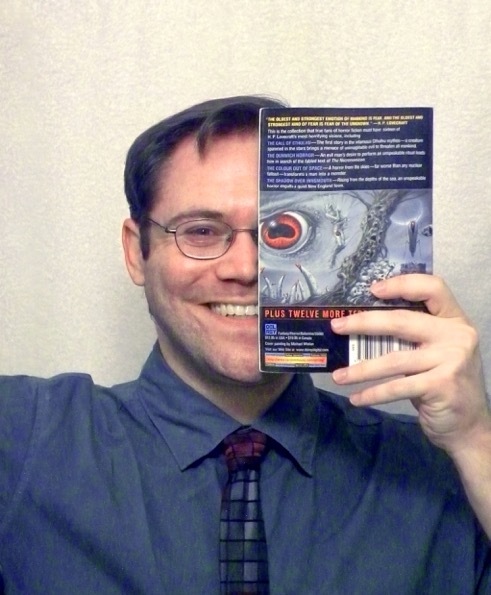 Lovecraft Literary Podcast , and with Chad and Chris's guidance, I resolved to read all of HPL's stories. I almost succeeded (I just could not get through "The Dream-Quest of Unknown Kadath"). 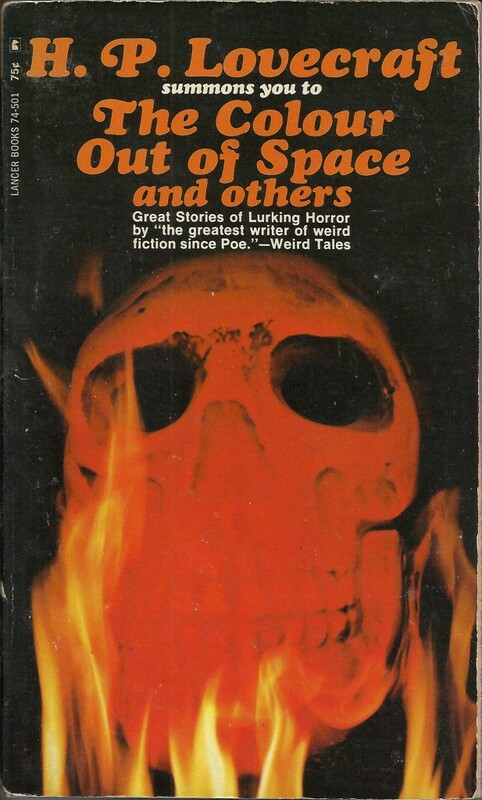 I enjoy the bleakness of HPL's cosmic horror, but I live for the "weird and unexplainable neighbour" tales: I often recommend "Cool Air" to HPL neophytes, and my single favourite tale is "The Music of Erich Zann". 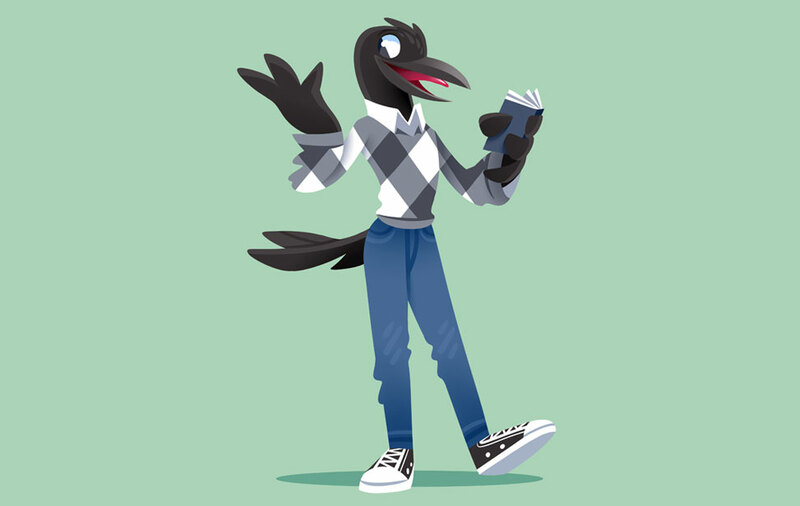 Nowadays, I am a librarian by day (a mental health librarian, which is like, the farthest possible thing from forbidden mind-shattering tomes, unfortunately), and by night I am often found pretending to be a crow on the internet. In my HPL time I like to learn more about the history of the man. I am slowly making my way through the collected letters of HPL and Robert E. Howard, and I still listen to the HPL Literary Podcast religiously. Someday soon I will make my pilgrimage to Providence. It is my utter delight to have been selected by our cold, uncaring universe to be the HPLHS member of the month. Thank you everyone at HPLHS for all you do!" Our Member of the Month for April 2018 is Caleb Long of Toney, Alabama. Caleb says: "I was born in, and have the dubious pleasure of having lived most of my life in, northern Alabama. Skipping the boring parts, I discovered Lovecraft when I was about thirteenish. Without going into detail, a combination of beginning homeschooling and maternal apathy and neglect meant that I was basically out of school entirely for a few years, not getting any mental exercise and — more importantly — not reading at all. I think the creatures are what first got me interested in Lovecraft, although the concepts are easily what kept me along for the ride. In spite of having ADD, of having not read fiction in years, and having to contend with migraines resulting from those two facts when I did try to read, I was able to brute force my way through completing some of Lovecraft's tales. ("The Shadow Over Innsmouth" was the first, though "Colour," "Rats," and "Witch-House" ended up trading spots for favorite back and forth ever since.) With the first few tales, reading became easier, and in time I started to actually enjoy the process of reading itself—all thanks, ultimately, to Lovecraft. Nowadays, I spend my time whittling away at a little worldbuilding project in AD&D 2E and playing 5th Edition on the weekends, in which I have the unquestionable pleasure of playing a (scientifically accurate) velociraptor monk of the Sun Soul martial arts school named Tikitill. (I also try to convince other people to play 2E, though I've yet to gain traction on that point.) 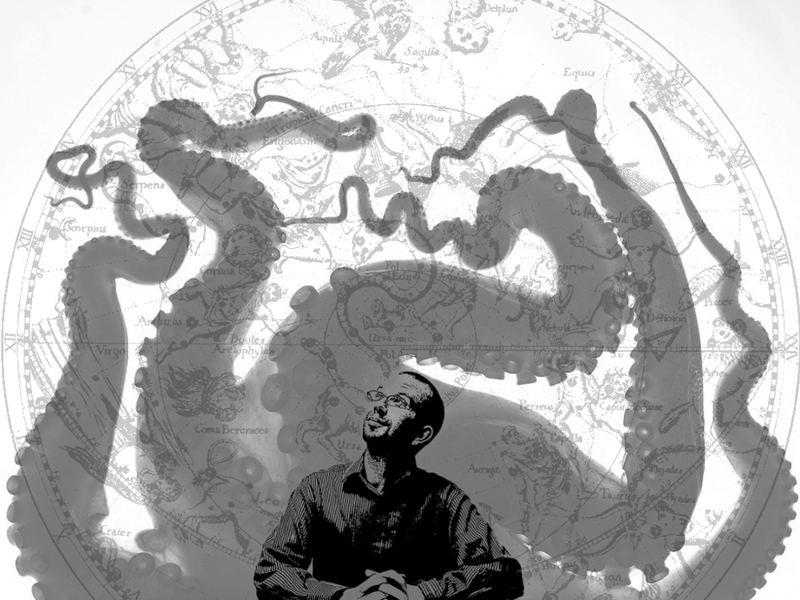 I've also been helping my best friend, who is trying to write out his own translation of the Necronomicon using Tyson's as a base — basically keeping everything relating to al-Hazred's history, personality, and philosophy the same, but trading out the occultist nonsense with research- and mathematics-backed science fiction. While he obviously doesn't intend to publish it, this project has lead to a lot of useful worldbuilding between us, and permanently colored my perception of the Mythos. (It's hard to go back when you've found a system of physics that actually allows "magic" of the Lovecraftian variety to function.) 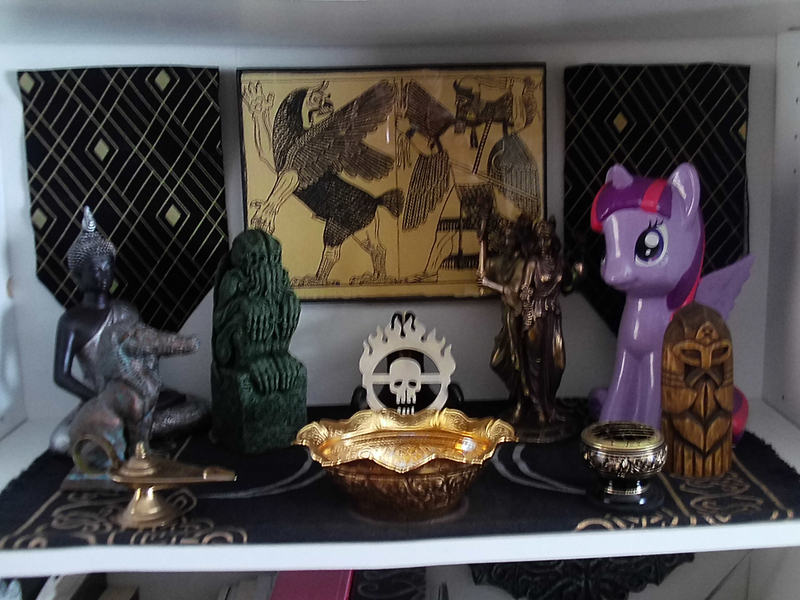 I've also spent a considerable amount of time and money assembling my own lararium — a Roman-style shrine to the household Gods — following said best friend's example, and I've included a picture of such for all the world to see." Our Member of the Month for February 2018 is Håkan Torevik of Rättvik, Sweden. 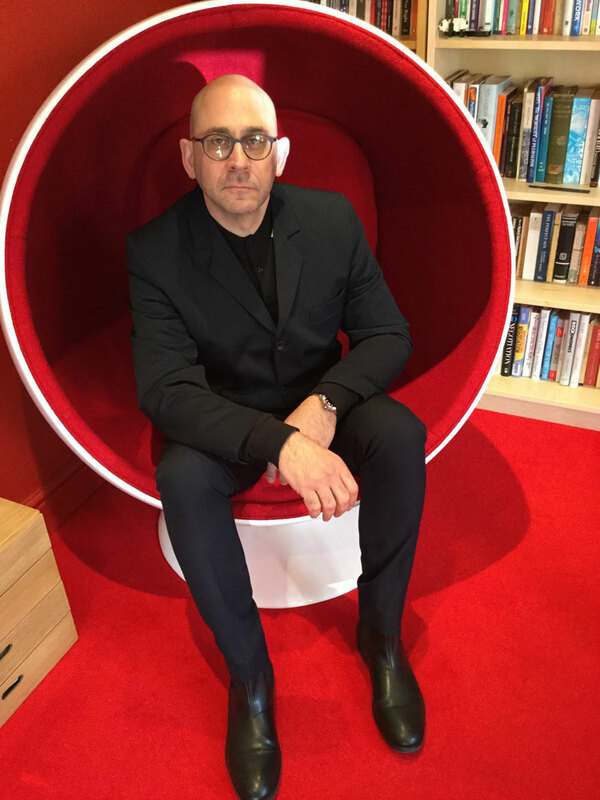 Håkan says: "I was born in a boring small town in the west of Sweden and had a normal, boring childhood. However, at the age of nine I had my first literary revelation when my mother gave me a copy of The Hobbit. This has led me to a lifelong addiction to reading. The addiction to words had me scour the local library for the fantastic and the terrifying, so there among the shelves I first encountered the magic of HP Lovecraft a few years later. The first fix was Skräckens Labyrinter, a collection of the master's short stories selected and translated by Swedish SF-legend Sam J Lundwall. I borrowed that many times over the years until I could afford to buy my own books by the master. One of the first stories I remember reading, which still is my favourite, is "The Colour Out of Space". Since then I have read his collected works numerous times and I keep returning to him, no matter how many other authors I read and like. Out of the many wonderful things created by the HPL Historical Society my definite favourites are the Call of Cthulhu motion picture and the Dark Adventure Radio Theatre. Since my discovery of HPL, I have grown up and moved to Stockholm to have a career in IT. After some years, I realized my city apartment didn’t fit all my books so we relocated to a 19th-century house overlooking the hinterlands of Dalecarlia in the middle of Sweden. My days are spent as a middle aged public servant and my nights are spent reading, cooking, playing the guitar (badly) and most importantly being the servant of an eight-year-old Cornish Rex cat goddess. Deeply honoured to make your acquaintance! 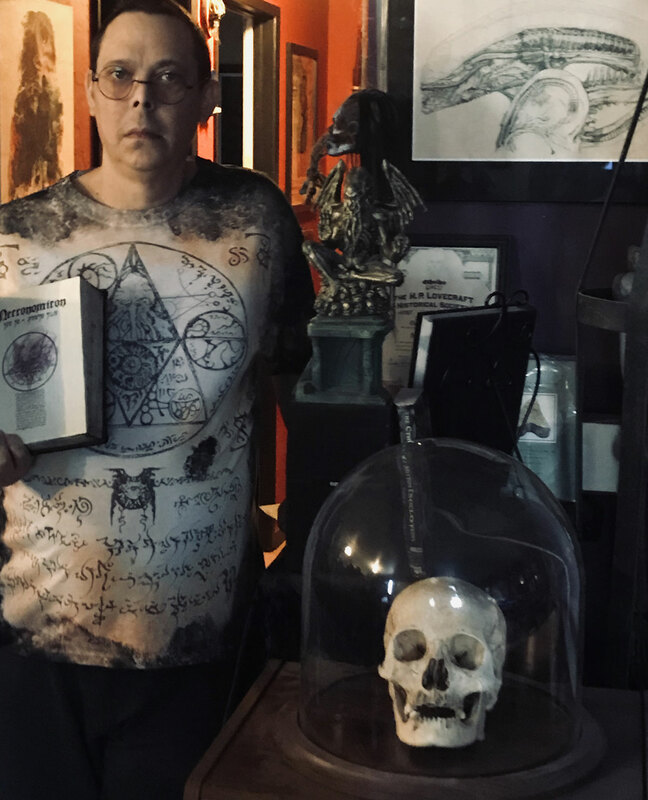 (Note, that old grimoire in the back of the picture is most definitely NOT a copy of Olaus Wormius' translation into Latin of the Necronomicon)"
Our Member of the Month for December 2017 is Kenneth Shaw of Brooklyn, New York. Ken says: "I am a designer/animator for television living n H.P. Lovecraft's least favorite place to live, Brooklyn, NY. On the weekends I can be found in a print /shop in Gowanus screen printing. My prints often take their inspiration from works by Lovecraft and Poe. I grew up in Connecticut and Massachusetts, connecting with H.P.L. 's image of a Gothic New England. I first discovered Lovecraft in a comic adaptation of "Pickman's Model" I read when I was in junior high. H.P.L. 's name kept coming up even amidst the horror media available to a 13-year old in the early 80s. I found the classic Del Rey, gray and red Bloodcurdling Tales of Horror and the Macabre at my local Waldenbooks. I have to admit my attention span at the time made his writing challenging, but I kept returning to it. While reading "The Dunwich Horror"" I felt a key turn in my head and became hooked. I then discovered his hand was in many of the things I loved. Ridley Scott's Alien, John Carpenter's The Thing, Stephen King novels, comics and videogames to name a few. I am thrilled to be selected as HPLHS Member of the month. The camaraderie of Lovecraft enthusiasts is amazing. We have inherited not only a connection to his work, but his love of correspondence. The more I mention him online, the greater number of digital pen pals I have." The HPLHS was proud to offer a limited edition of screen prints of "The Shadow Out of Time" by Ken in our online store, although they are no longer available. Be sure to check out Ken's portfolio online! Our Member of the Month for November 2017 is Paul Helfrich of Dayton, Ohio. Ironically, of course, not a single tale in that volume is actually by Lovecraft! But I loved it, and I went on to purchase all the remaining Ballantine editions – plus others I discovered at used book sales, including this one: ..and I still have both, over 40 years later. Like many Lovecraftians, I’m an avid reader of all sorts of things; while I put Lovecraft at the top of my list, I’m also a big fan of the work of Joyce Carol Oates, Stephen King, Tolkien, and George R.R. Martin. My favorite Lovecraft story is "The Haunter of the Dark"; I’m also very fond of "The Whisperer in Darkness", "The Case of Charles Dexter Ward", "The Shadow Out of Time", and "The Thing on the Doorstep", the latter a bit underappreciated, in my view. I also especially enjoy two of Lovecraft’s non-Mythos stories, "The Picture in the House"" (that outrageous dialect!) and "Cool Air". My most vivid experience with Lovecraft was reading "The Dreams in the Witch House" at probably age 12-13; scared the crap out of me! If anything I am growing in my Lovecraft fandom as I get older; I’ve been an HPLHS member since 2011 and feel very fortunate to have been able to attend Necronomicon Providence in 2015 and 2017. My (Ohio) license plate is HP LCRFT. For me, Lovecraft’s cosmicism is not depressing, but rather I find it liberating and enervating. It’s a constant reminder that whatever the trials of daily life, things could be - probably really are, but we’ve got that whole “placid island of ignorance” thing going for us – far, far, worse. 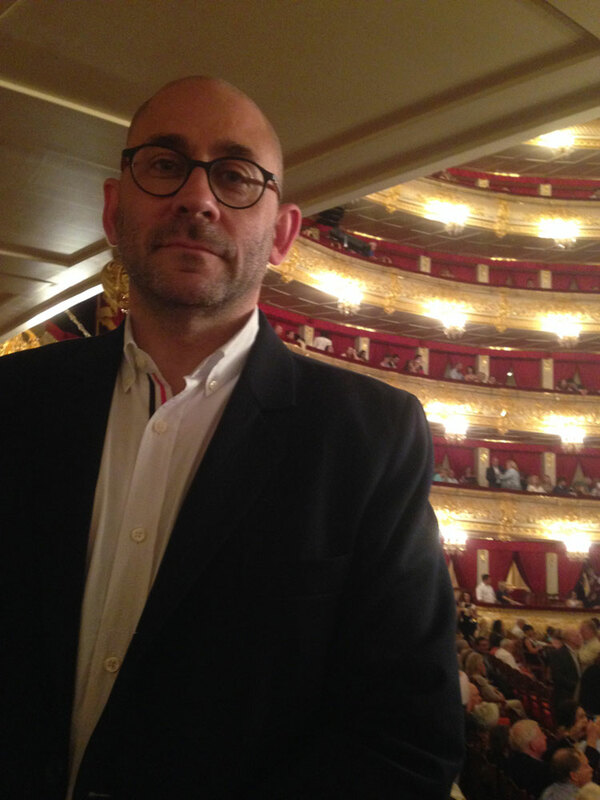 When not faltering down black cobwebbed steps and lingering around sinister monoliths, I’m a performing arts administrator in Dayton, Ohio, where I live with my wife and two children. I’m a lifelong musician and particular fan of all the various flavors of metal and prog rock, as well as symphonic music, so for me, the rock opera version of The Dreams in the Witch House is like the greatest thing ever! I’m also a big fan of the D.A.R.T productions, which I most heartily recommend to all fans of HPL. Our Member of the Month for October 2017 is Ezriel Joshua of London. Ezriel says: "I started reading H.P. 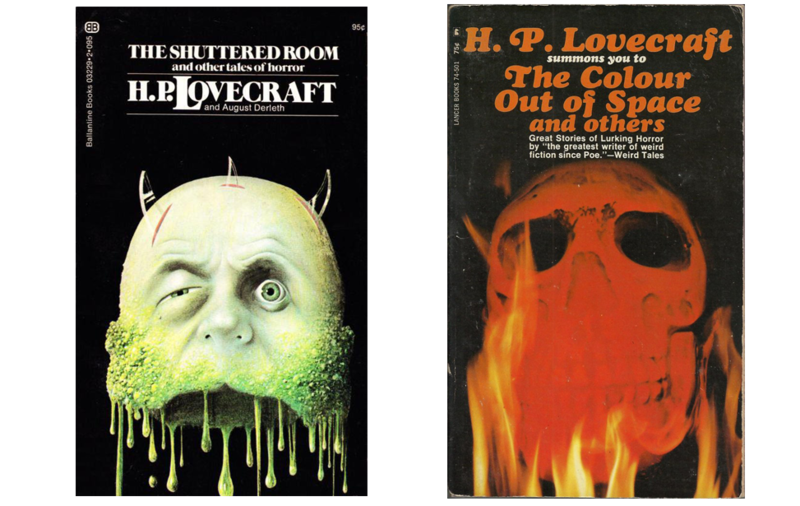 Lovecraft’s works when I was a teenager, in Brighton, England, in the 1970s. A man called John lent me a copy of At the Mountains of Madness. He told me he’d been on Christmas Island in 1957, serving in the British armed forces, when they tested a nuclear weapon. Like many nuclear test veterans, he experienced physical and psychological problems for the rest of his life. He told me that when the bomb exploded he could see, through the ‘protective’ goggles he’d been given, the bones in his hands, and that the mushroom cloud appeared to contain shadowy images of parts of various creatures - claws, tentacles, wings, and suchlike. John claimed that he had a copy of the Necronomicon in a brown leather satchel. When I said that I didn’t believe him, he took me – and the satchel – to a nearby church. We’d only been in the building a couple of minutes when a priest emerged from the vestry and shouted at us to leave immediately. I never asked John about the Necronomicon again, but sometimes I wish I had. When John passed, he left me a hand-written volume of prose and poetry fragments called The Book of the End. 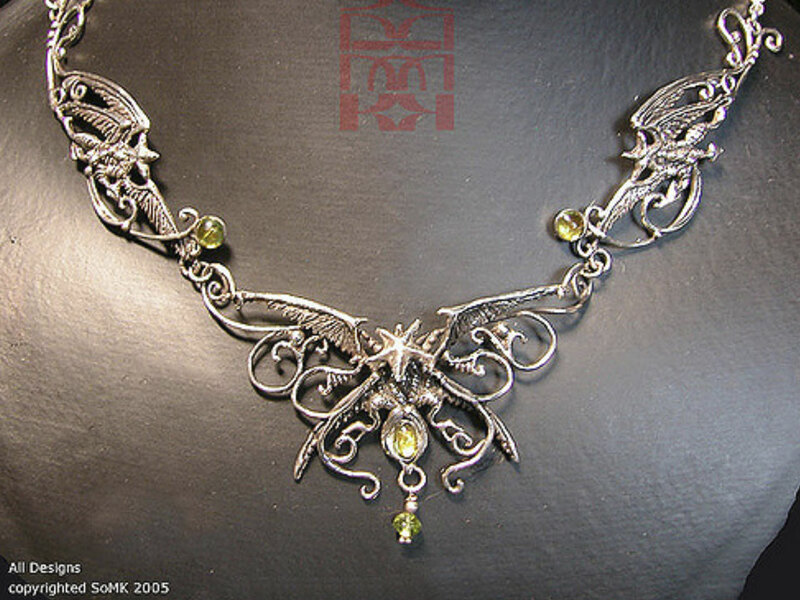 I treasured it for many years, but it mysteriously disappeared about 10 years ago. Today I read Lovecraft regularly, as well as related fiction such as Matt Ruff’s Lovecraft Country and Paul La Farge’s The Night Ocean. I also enjoy dipping into the essays in the volume The Age of Lovecraft, edited by Carl H. Sederholm and Jeffrey Andrew Weinstock. 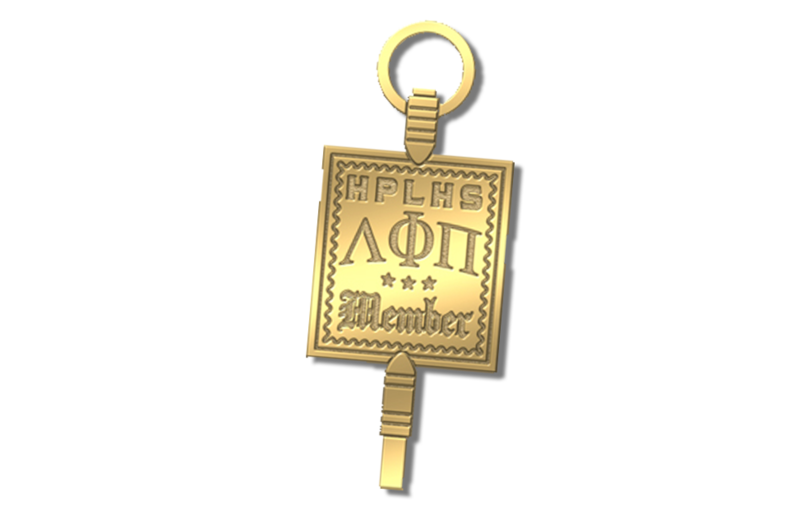 I am proud to hold Lifetime Membership in the HPLHS, and honoured to have been chosen by the Powers of Randomness to appear on the website. "My first exposure to Howard was age nine. Family was visiting my grandmother in Milwaukee, WI. There was a kid, David, who lived across the alley. He was an avid reader who exhorted me to read Lovecraft. That kid is now a professional stage magician. Over the years I read Lovecraft when I could. 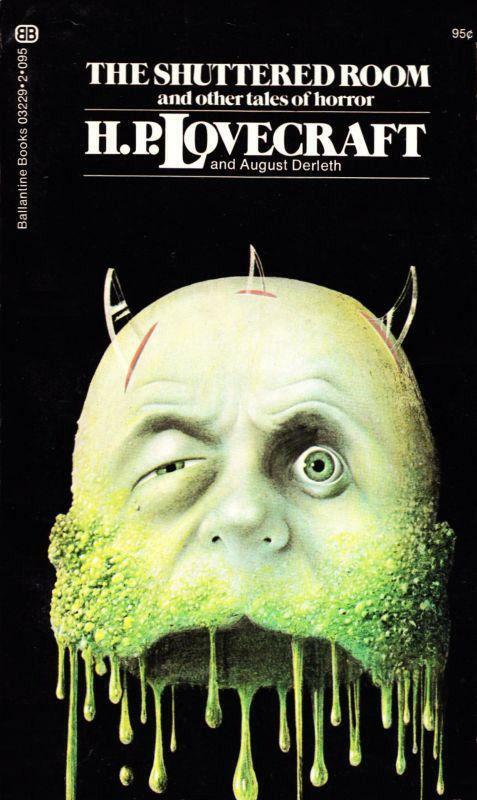 Surprisingly, during my high-school years in Zion, IL, there was even a grade B rock band called HP Lovecraft that spurred myself and others to acquaint themselves with his work and others in the genre like August Derleth. As I have aged (I am now 67), I've found his particular brand of terror philosophy increasingly panic-inducing...the destruction of reality and the reordering of consciousness is not comforting but it is entertaining in a macabre way. The Ancient Ones are incapable of any consideration of our existence." "Hello ! 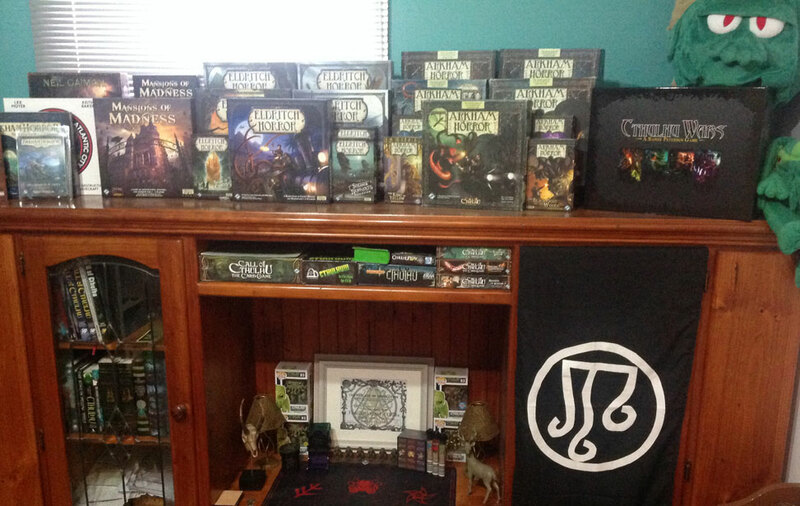 fellow Lovecraftians, I am Chad Redding, proud member and follower of the Cthulhu Mythos! I am a history major at USF in central Florida, and avid creepy tales aficionado. I enjoy reading anything Lovecraft, my favorite but not limited to is of course The Call of Cthulhu!. A great honor to be the member of the month!!" Our Member of the Month for September 2016 is Chris Lott of Santa Clarita, California. "I don’t remember exactly when I first became an HP Lovecraft fan, but once I caught the fever it never left. I think that one of the reasons that Lovecraft’s works have has such a lasting impression upon me is that I relish the idea that as I go about my mundane, day-to-day existence that there might be shadowy, unseen forces at work or occult mysteries waiting to be uncovered. Or it may just be that they’re damned fun stories. 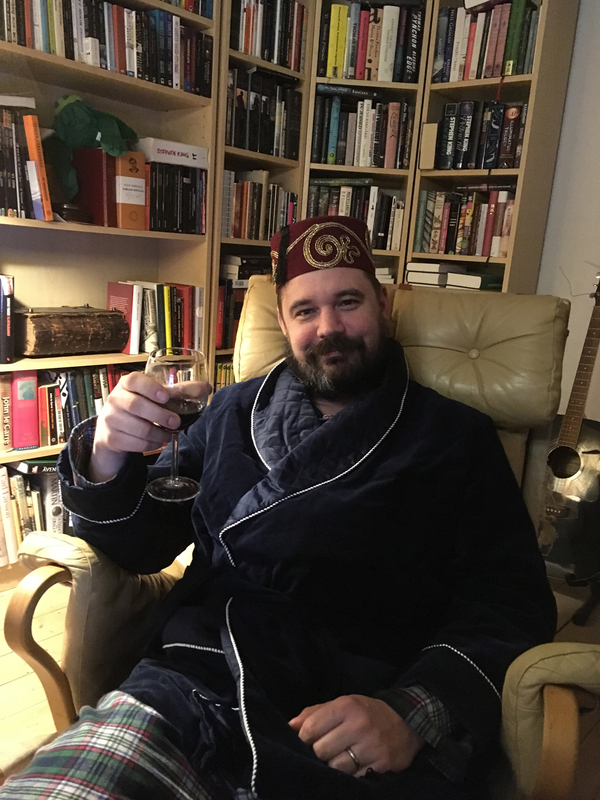 Thanks to the HPLHS my passion for all things Lovecraftian has only grown and now I’m a full-fledged addict and lifetime member of the Society." 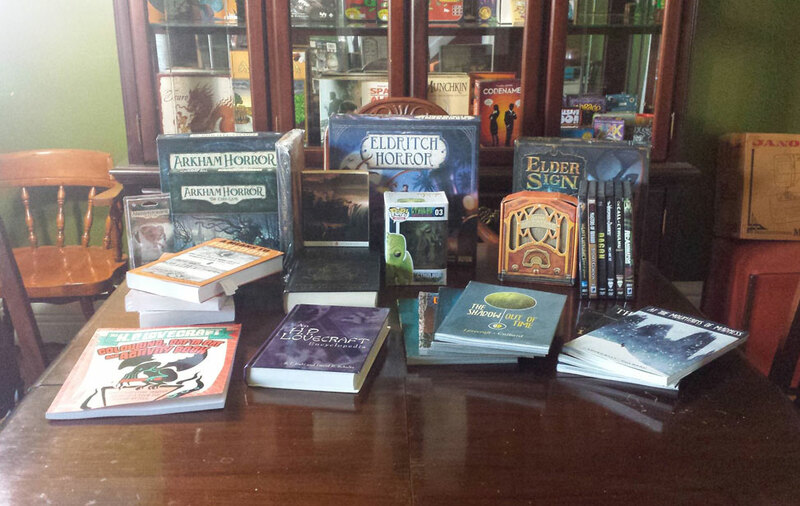 "When I’m not reading Lovecraft or listening to the latest Dark Adventure Radio Theatre serial, I spend my free time immersed in RPGs, board games (Eldritch Horror is a favorite, naturally), comics and other suitably geeky pursuits. I currently live in Santa Clarita, CA with my wife Carly and our two dogs." 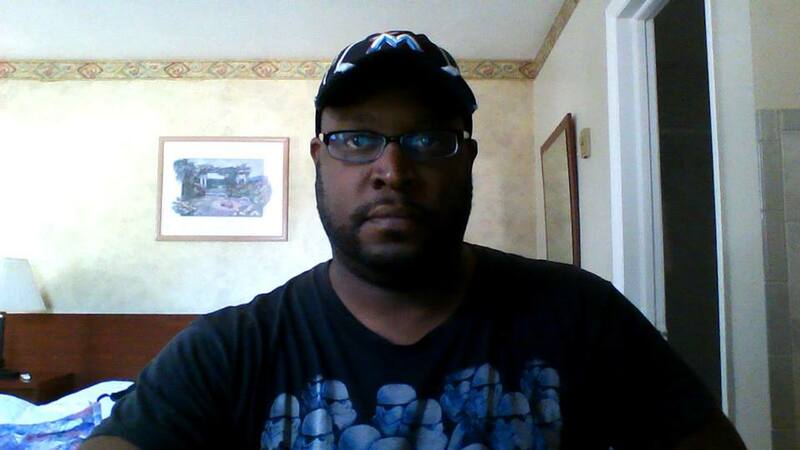 Our Member of the Month for July 2016 is Michael Jenkins of St. Petersburg, Florida. Mike is a professional graphic designer who enjoys making Lovecraftian props. 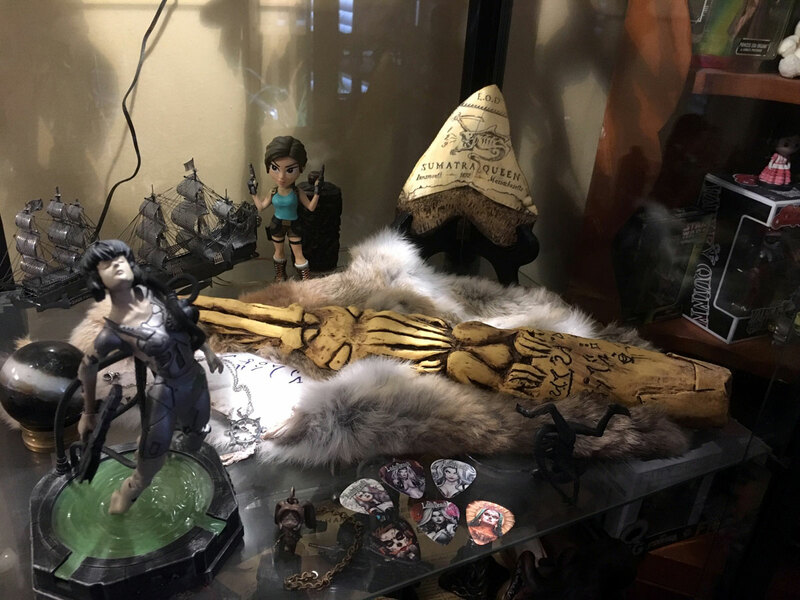 Several of his props hang on the refrigerator door at HPLHS global headquarters. 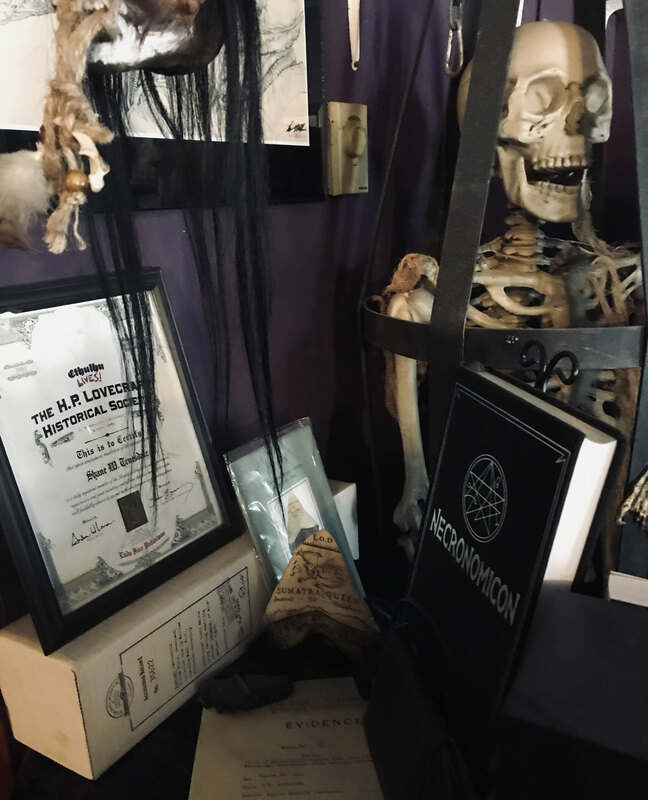 "One of the first props I made was a crude, hand-bound Necronomicon," he says, "used mainly as a prop for a photo series in college. My skill set being what it is, most of my props are of a printed and 2D nature. 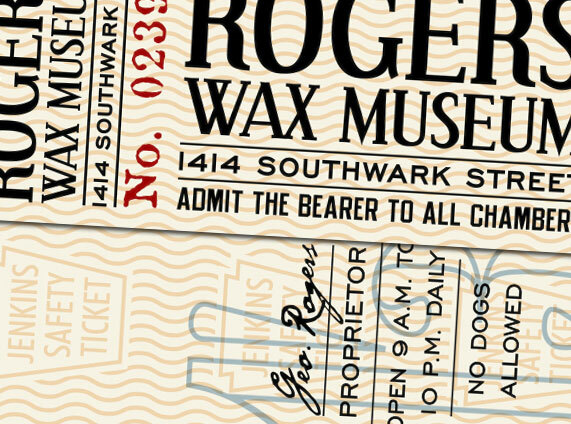 I’ve made silly mock postcards, designed matchbooks, tickets, title pages and the odd invitation. The Silver Key you see below is an assemblage of found objects, cheap metal jewelry beads, strung together to resemble a medieval Arabian Kaaba key. 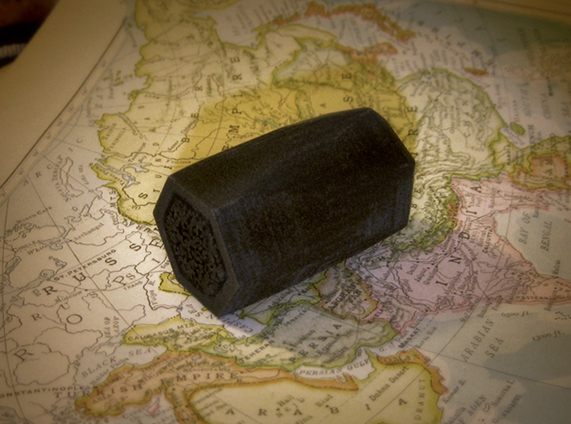 My Black Seal (from The Novel of the Black Seal, by Arthur Machen) was actually designed in a browser-based 3D program and 3D printed by an online vendor. 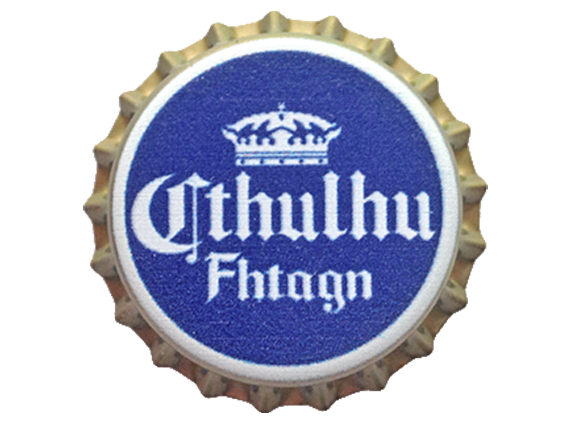 The more tongue-in-cheek Corona/Cthulhu bottle cap parody was also printed on demand for me by an online vendor. Though I find picking one single story out of the corpus to be like choosing one ‘favorite’ family member, I will champion The Haunter of the Dark, which I feel gets less appreciation than it deserves. Mike says, "I discovered HPL in late high school or early college, which I gather is later than most of us. Besides ‘weird fiction’ like HPL, REH and Poe, I enjoy science fiction and historical non-fiction. Though I find picking one single story out of the corpus to be like choosing one ‘favorite’ family member, I will champion The Haunter of the Dark, which I feel gets less appreciation than it deserves." Our Member of the Month for March 2017 is Paul Maclean of West Yorkshire in the United Kingdom. Paul is a truly delightful fellow who works tirelessly to promote Lovecraftian gaming in the U.K. and around the world. 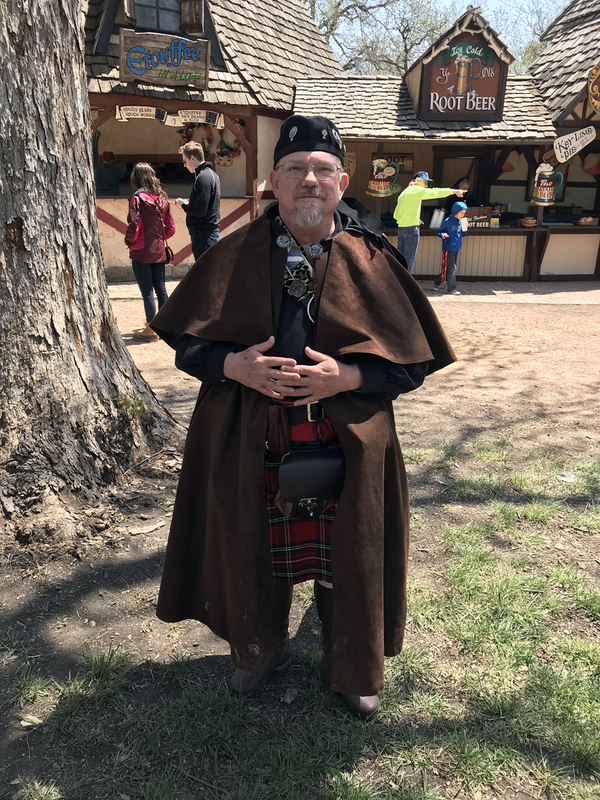 Paul says: "My name is Paul Maclean and I’ve been a fan of Lovecraftian worlds for over 30 years - ever since I encountered Chaosium’s Call of Cthulhu roleplaying game back in the early ‘80s. The back pages of those games featured lists of Lovecraft’s works - but being British, it was something I couldn’t get hold of until several years later with the advent of cheap UK paperback reprints. I devoured all of HPL’s stories over one long summer, while listening to lots of early Mike Oldfield. It may have had an effect. Following those formative years I became an archaeologist, which is great in a certain Lovecraftian way, but less so if you want to earn any money (though the lack of such is also probably quite Lovecraftian). I remember the landmark year of 2005 and the HPLHS’ film The Call of Cthulhu - it showed just what amazing things could be done by dedicated folks even on a shoestring budget. Its production still astounds me today. 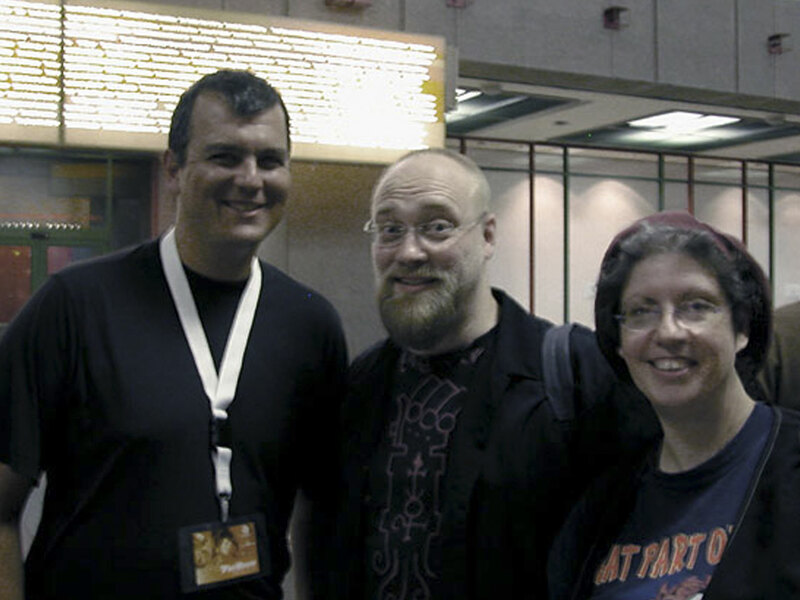 Despite being across the Atlantic I’ve had the good fortune to meet Sean and Andrew along with other members of the HPLHS including Chris Lackey of HP Podcraft (now an honorary Englishman) who sometimes joins our podcasts (The Cthulhu Breakfast Club and News from Pnakotus). They are all great people. As soon as the HPLHS re-opened membership a few years ago I joined up; I always look forward to whatever they have in store next! If you want to see what I (and a few friends) get up to, just visit YSDC. As for what the HPLHS are up to, well you’re already here. :-)"
"My foray into Lovecraft came more round-about than most other die-hard fans of his work, I would wager. While I read quite a bit growing up, my bookworm tendencies leaned towards the science-side of the fiction realm versus the horror for which Lovecraft was known. I was a nerd in the stereotypical sense – roleplaying (mostly Star Wars and D&D 3rd Ed.) and video games, comics, etc. Since I’m sure that the Mi-Go the Society has on retainer would drag the truth from me, I may as well confess that Robert E. Howard was where my initial research led me. As many know, Howard was a contemporary of Lovecraft, even contributing several of his own elements to the Cthulhu Mythos. Regardless, I soon thereafter discovered Lovecraft. As a roleplaying gamer, I love both of these authors for different reasons: Howard is excellent from a player’s perspective as most of his characters fight back against the darkness and often win, but Lovecraft is my preferred from a Dungeon Master’s perspective since normally it’s the antagonists that frequently consume the characters – either figuratively or literally. As is often the case with people who run roleplaying games for their friends, creative writing is a side interest of mine. I spent a lot of my time while I was stationed with the Army in South Korea from 2007-2008 practicing my skills. Fast forward a few years. 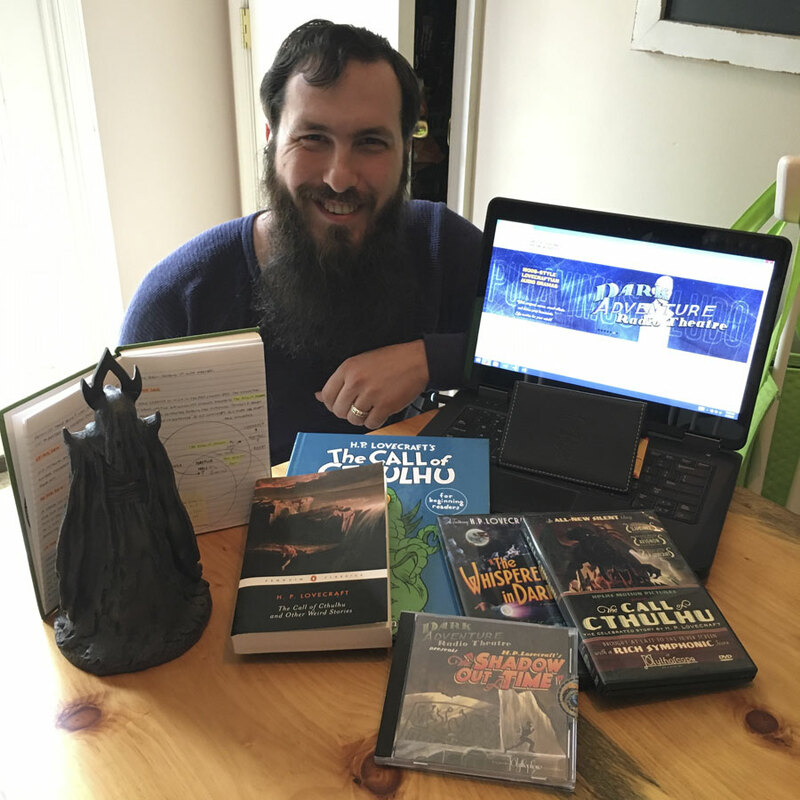 Christmas 2015, my mother-in-law sent me a most wonderful gift – an experience from The Mysterious Package Company titled The King in Yellow. Being the roleplaying nerd that I am, I decided to journal my experience “in character” as if this whole thing were real. 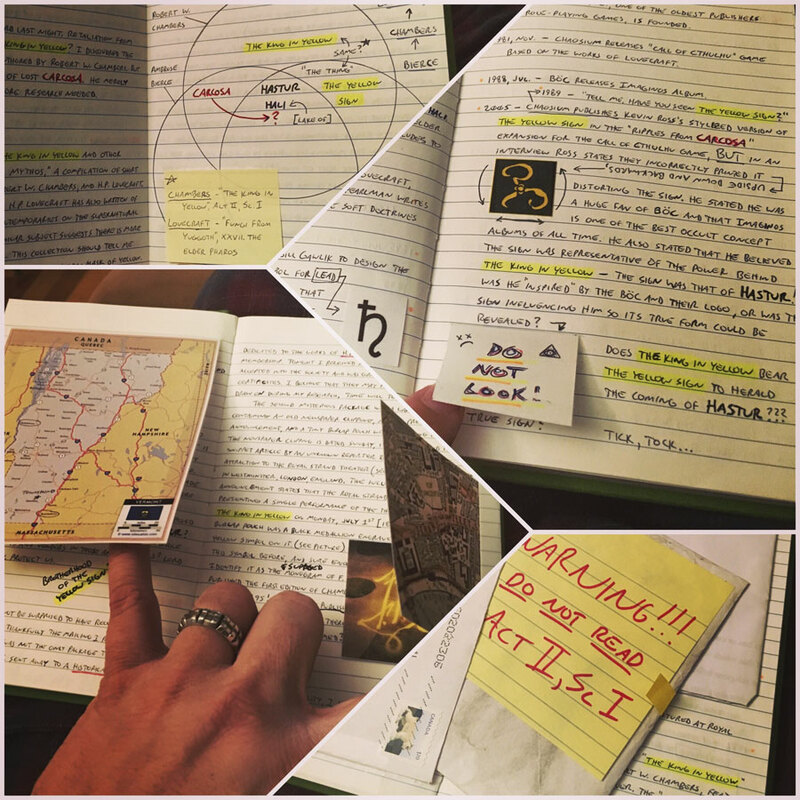 I don’t think I can properly convey how much fun I had creating this journal (see picture). The most enjoyable part, though, was how it led me down a rabbit hole of research and connections to other authors. I took a few creative liberties and suggested some conspiracy theories of my own, but all highly plausible if one’s mind was being… influenced… by supernatural forces. It was also at this time that I decided to join The Society as a life member in support of their mission. While I’ve never played a game of Cthulhu Lives!, I love that the whole point of The Society is “we thought it would be fun.” And having fun I am. I participated in my first “Secret Shoggoth” this past year and received a very nice thank you note from the recipient. I also have started my collection of DART performances to accompany my Mythoscope DVD copies of The Call of Cthulhu and The Whisperer in Darkness. I never thought I’d be a stamp collector, but I find myself trying to plot out how to acquire additional stamps for my membership passport. It’s addictive. My best friend’s wife grew up in Lovecraft’s home town of Providence, RI and her family has extended an open invitation for us to come visit. I think a pilgrimage is in order. I’m pretty sure there’s a stamp waiting for me there. Lately though, my focus has been on adjusting to fatherhood. My wife, Ashley, and I added our first addition to our family, a little girl named Eve, on May the 7th. I’m excited since now I have someone to begin sharing my enjoyment of all things Lovecraft (see picture). Ashley just shakes her head at me, but I think she’s probably a Mi-Go spy." Our Member of the Month for May 2017 is Sophie "SoMK" Klesen of Sherbrooke, Quebec, near Montreal. With her husband Alex, So describes herself as a "two-headed entity", which should not surprise anyone from this group, really. One head (Alex) is a translator by day and gamer by night. The other (Sophie) is artist by day and night. Both heads have a similar background: their love for science fiction and horror goes way back to their childhoods. It was nurtured by movies but started with books: HPL's among them. 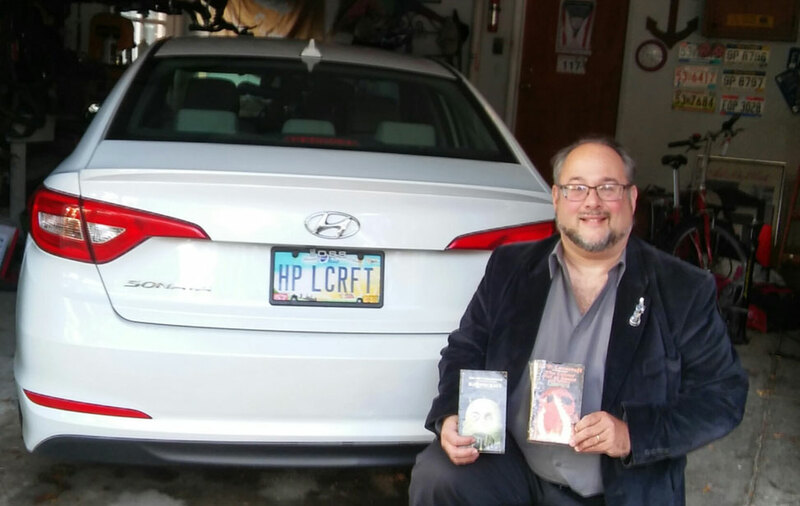 We asked Sophie and Alex which book started it all and how they began reading Lovecraft. Alex: "Always been fascinated by SF/Fantasy genre, starships and Jules Vernes. The very first book I bought was Tintin's Explorers of the Moon, when I was about 7. I remember that years later my mum thought it was a good idea to get me some 'real' SF books for my 11th birthday since I loved SF so much. So I got The Martian Chronicles and The Illustrated Man and that was that. I first read Lovecraft when I was 16 years old. I remember it was "The Shadow over Innsmouth" and I read it during the summer holidays with friends on the Brittany coast. 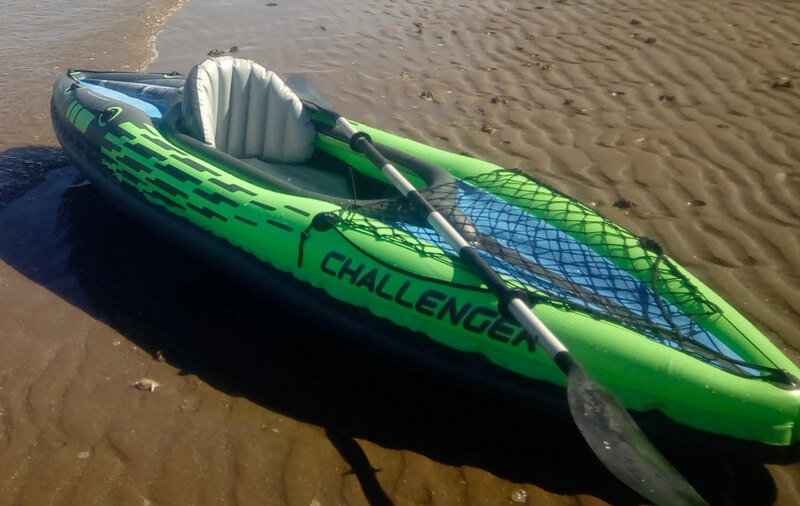 We were camping near some cliffs overlooking the sea, reading until dusk to the sound of the crashing waves… and as an added difficulty, we were three friends who wanted to read the same book (which also included Charles Dexter Ward) at the same time! 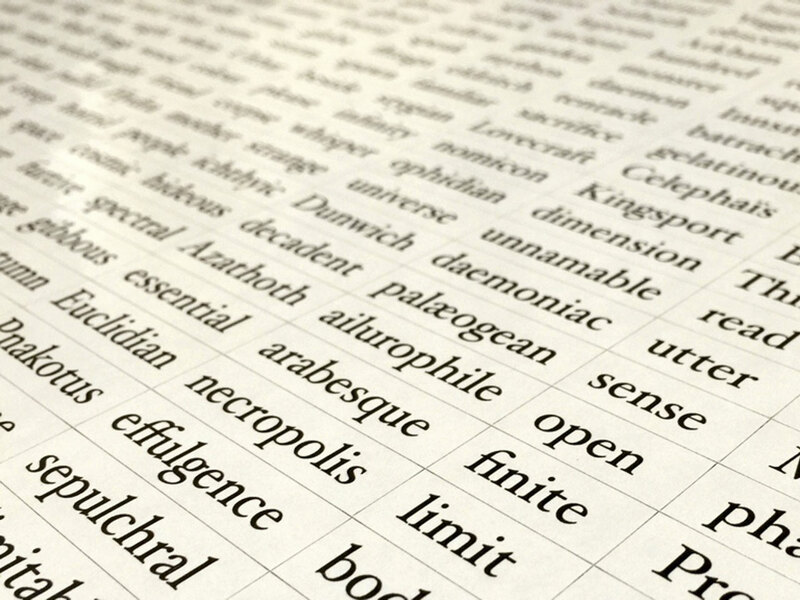 We were lucky to have good translations of Lovecraft's novels, be they French or German." So: "My grandmother read me some Tolkien when I was very young but as far as I remember, I think that the first book I bought with pocket money was a Zelazny. I came to Lovecraft during my reading bulimia that started around 12 or 13 years old. I bought and read everything I could find about science fiction and horror. It was shortly after the first Alien movie, definitively my turning point. I totally fell into it and I didn't look back ever since :p "
We asked them if Lovecraft directly influences their actual work. 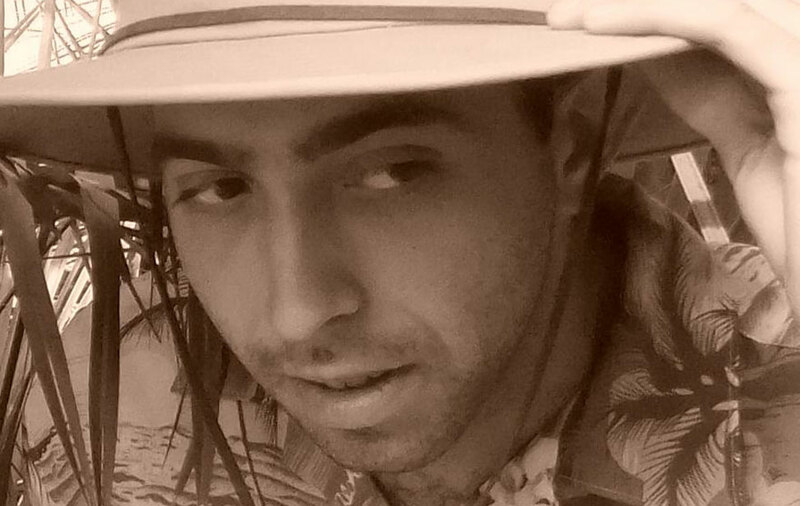 Alex: "I am a translator, and mainly for the game industry so yes, I frequently use or come across references. Lovecraft's mythos is a pillar on which a lot of worlds are built. What fascinates me in Lovecraft's novels is that moment when the limitation of the human mind makes the perception of the protagonist — and that of the reader — jump back and forth between horror and fascination. So, the Elder Things, the Great Race of Yith or the Fungi from Yuggoth totally fascinate me. 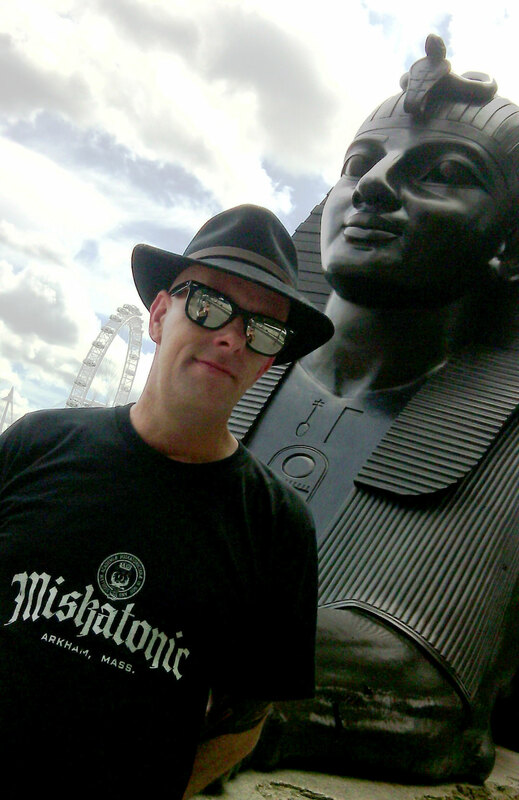 (…and the way HPLHS brought 'The Whisperer' to its logical conclusion, it was really excellent!)" So: "It is a sort of background task, something I go back to again and again. A few years ago it was mainly through jewelry and more recently with illuminated manuscripts, but there is always something brewing. My favourite story still is "At the Mountains of Madness" (for the both of us), mainly because of the setting itself (South Pole ! Could as well be Mars!) but also the sculptures and the Elder Things themselves. I have a fascination for this alien species, their art, their society. They are not malevolent, they are different. That is the part I love. Not quite sure about the idea that something wants to come back and eat us but I don't need reminders that we as a species don't count for much in this universe XD"
In the slideshow above are a couple of pictures of the gorgeous jewelry that So and Alex have made, and you can check out more of their past work at this link. You can see Sophie's illuminated manuscripts and other current work at Sophie's website.